Canoe sailing - where do I start? Thread: Canoe sailing - where do I start? The current weather has prevented me from getting out on my local water (the Exe estuary). It's wide and long and allows the wind to really pick up on an otherwise not so windy day. I was reading another thread on how to tack and thought this sailing thing might be just what I need to let me enjoy a day on the water even when it's too windy to paddle (like today). Image of the Penobscot 164 from AS Watersports where I bought it. I'd like to start with something SIMPLE that I can make myself (partly to keep costs down, partly so I know I can repair it if necessary). An absolute must is that the canoe remain perfectly suitable for normal paddling on calm days. I'd like things I can bolt onto the gunwales and remove. The simpler the sail is to manage the better. I don't know anything about sail design or style so will rely on those more experienced than myself. I'm not looking to break any records; a nice glide on the water will suffice. The most important factor would be the ability to tack into the wind, so whatever sail design allows me to sail closest to the wind is probably best for me. Furthermore on the simplicity side, do I need a rudder, or could I just steer with my paddle? Looking at your location... your best place to start would be the Open Canoe Sailing Group Meet on 4 -5 June at Roadford Lake if you can make it: see the national meets calendar here. That's a long way to go for the northern-based folk... but hopefully you'd get to see (and with any luck try) a fair few sailing canoes. In the meantime... you could try calling Solway Dory and talking through what you want with one of the Daves: they are great to contact for people wanting to build things at home, as well as for folk who want a Solway Dory solution - they are enthusiasts first and foremost! Last edited by GregandGinaS; 15th-May-2011 at 11:01 AM. Thanks for that advice Greg. Since it's close to my birthday, I think I might be able to drag the whole family along to that event. BTW, your link to their calendar is a little broken but I managed to get to it nevertheless. Thanks again, I now have a fair bit to read and do before I can pose a few more educated questions. I've left a message with the Roadford Lake Outdoor office for details. I'll post here when/if I get them. The site is booked and we are expected. I will find the correct contact number and post it here later. Thanks so much Dave. I just had a call back from Roadford Lake who gave me a number of 01822 870 393 (one 7 missing from your number). The number they gave me worked, but no answer at this time of day. I'm trying to find out more information about the day: Costs (parking, entry, launching, etc.) and whether I'm allowed to bring and launch my canoe at all. I'm trying to make a family day of it but given the that the rest of the family aren't as enthusiastic as I am, the costs might not be worth while for them. Canoe launching is normally £6.50 per day, but if we have 8 or more canoes it will reduce to £4.00. You must have Third party insurance. BCU or OCSG membership includes this. But make sure you have your membership card in case you are asked. Launching is allowed between 9.00am and 5.00pm and there is rescue boat cover for this period. There is a café on the other side of the lake serving lunches and teas. And if the weather is fine we can have the use of the centre barbecue. Hope that helps. I can't make it myself but hope you can and have a good time - Warin will make you welcome. "The most important factor would be the ability to tack into the wind, so whatever sail design allows me to sail closest to the wind is probably best for me." This made me chuckle because it's pretty close to the complexity I'm hoping I can get away with. I've tried holding up the Boogie board I use to kneel on in the canoe and it has helped down wind in good wind, but I don't have enough hands to hold up a temporary sail and steer. FWIW here's my take on things. You could try making your own or improvising using something else like a tarp or you could go down the poling pole type sail route but non of these are likely to give you the upwind performance that you desire. I would have thought that the Solway Dory Expedition Rig would be your best option, this will give you excellent upwind performance if you use a leeboard and is a "proper" sail which would allow you to turn your canoe into a genuine small sailing boat without having to make any modifications which would compromise the paddling performance. I've bought the 35 sq ft Expedition Rig and it's been a revelation. I hoped that it would allow me to sail upwind slowly but it offers excellent upwind performance and allows proper sailing performance. I'm not sure if you've done any sailing in the past but that is a consideration, the larger Exped Rig does give plenty of power and could be a handful in strong winds if you have limited sailing experience. The smaller version would still give good performance but with a larger margin for error when the wind picks up (plus it packs up smaller and is cheaper). Solway Dory modified my rig to reef down to around 20 sq ft (they now offer this set up as the Expedition High Spec) and at that size it's useable in very strong winds. I would imagine that the 24 sq ft version would reach it's limit in conditions when you'd be likely to be in danger of being swamped by waves anyway. I've come to the conclusion that whilst it's fun designing and making your own kit, you're likely to end up spending a fair bit on materials, time and effort and will end up with something that may not function as well as you'd hoped. If you go with a Solway Dory set up you may spend a little more initially but you're effectively buying into their years of experience of what will work and what won't and will end up with an effective sailing canoe. Whatever you decide on, I hope you have fun and keep us posted on how you get on. Yesterday afternoon we put on at Martham and paddled / sailed to the pub at the north end of Hickling. That's daughter, dog and I in an 18' Jensen... in pretty light winds. Our little expedition rig was an easier solution: we pootled along up to 5 mph with me paddling gently. Of course... I would also have found paddling to the pub pretty straightforward: the wind was mostly from behind us.... and by applying myself with the paddle I could have made pretty reasonable time on that leg. The return leg was a somewhat different matter. I've paddled that leg into the wind before: it can be a pretty unrewarding slog. I don't particularly mind that in my solo boat as it's a good work out to sit and switch and it's fun to try and seek out bits of shelter here and there to aid progress... but soloing a tandem, without a sail, that return trip would NOT have been so nice: my daughter would have been encouraged to bend her back a little to help me out on the more exposed stretches... and I'd have been far too busy paddling to be good company for her. We were not heading along the direct line home at many points on that return leg... but my daughter was standing out on the gunwales with the wind in her hail and a big smile on her face (frequently right out, with her ams at full stretch and head right back), and I was having fun trying to see how consistently we could break 5mph (as measured by GPS) when close hauled. I was on the Solway website this morning and quickly started to reach the same conclusion. I could spend weeks, nah months, mucking about and making something that's not up to scratch. The decisions now are on price and size. I've had some sailing experience but no formal training. I adore the simplicity of the catamarans found in Carribean resourts. Rudders, single simple triangular sail. I'm finding I learn something on nearly every visit to a web page, whether it be terminology, design or technique. I think I now need to look at the wind speeds we typically get on the Exe estuary, the size of sail suitable for that weather, and then see if the bank account can withstand the impact. Last edited by bhofmann; 20th-May-2011 at 11:54 AM. Right, I think your situation sounds quite similar to mine when I first contemplated buying a rig so here's some things to think about based on my experiences. First off I'd not bother with the rudder to start with. Steering with the paddle is a bit of a strange experience initially but gets easier with a little perseverance and I think with the smaller rig using the paddle would be okay (and would save you a lot of money). If you found later that you still wanted a rudder you could add it at a later date. The fact that you have sailing experience and understand how to sail would mean that you'd cope fine with paddle steering imho and it'd also fit in well with your doctrine of not altering the essential nature of your canoe as a paddling craft (the paddle is something you carry anyway). My initial thoughts were that I wanted a rig to use in strong winds when paddling is a bit of a pain (as Greg alludes too above) but I did wonder whether I would eventually want to sail more often so I decided to go for the bigger rig to give me more capabilities in lighter conditions (at the expense of some safety margin at the top end). I'm really pleased I did this as I now find myself sailing more often than paddling and I'm hoping to add a proper rudder and leeboard to my canoe. The 35 sq ft rig gives performance that wouldn't be too out of place in the company of full on sailing canoes with Bermudan rigs (although it's obviously not as quick as them, it's no slouch when sailed well as Dave S and Oceanic showed at the OCSG meet at Loch Ken). I think you would need to think very hard about where you see this sailing malarkey leading you before you buy. If it's purely to use in high winds when paddling is hard work then the small rig would be perfect but if you think you might be bitten by the sailing bug you might be happier with the bigger rig. If you could afford it the reefable High Spec rig would give you the best of both worlds (coincidentally the money you'd save by not buying a rudder would just about cover the cost of the reefable rig ). Whichever way you go I think you'd be pleasantly surprised by what the Expedition Rig can do. Chris is saying it all and rather well so there's no need to add much really. The SD kit is well designed and made - from the right materials. It may seem a bit spendy but with proper care (ie rinsing off after any salt water excursions, like yours) it will last indefinitely - presenting good value for money in the long run. Also - my brother lives in Lympstone and I've been trying to do a sailing canoe trip out on the estuary (or beyond on the right day) when I'm visiting for the last few years..
Last edited by windorpaddle; 20th-May-2011 at 01:29 PM. Firstly, please let me thank all you kind people for your time and advice. This has been a steep but thoroughly enjoyable learning curve for me. The more I think about the sailing "malarky" , the more I tend to think I might dive headlong into it. Anything that lets me spend more time out on the water, and enjoy more days on the water, is something I'm keen on. So if I don't go "the whole hog" and start with the bare basic rig, I thought I could get away with under £200. Still not an easy one to get past SWIMBO, but I fancy my chances. I'd like to repeat myself and say a very big thank you to everyone who's helping me join this group of (sailing) canoeists. I think your plan is a good one. And I think Chris put it very well. In case it helps, here's my experience. Like you I needed to get into sailing in a cost-efficient manner. (I've still only had a few outings, but I've just spent the day re-gluing my mast foot and rearranging the thwart, so I'm looking forward to more soon.) I went the SD big Expedition rig route and am very pleased with it. (Although I'm looking rather jealously at the reefable option that has now appeared. ) The foils were a little more than I thought I could afford first off, so I improvised as you are planning to do, buying a leeboard thwart in my case and making my own pivoting leeboard, rather than a clip-on. I'm sure it isn't as good as SD's, but it has got me started. I also have a second-hand rudder somewhere that I haven't got around to fitting yet and will probably wait until I have some spare cash to get Solway Dory to help me fit gudgeons & so forth. Paddle steering seems like a good skill to develop anyway (though I'm wondering if I'll have to readjust the thwarts and foot if I add a rudder in order to compensate for shifting centres of lateral resistance). So, by buying the sail that I'd have had trouble cooking up myself and improvising the extras, I feel I've got myself into the hobby and can now look forward to spending more as money becomes available--e.g. if I want extras like reefing or gudgeons to hang my rudder on. For me the initial price of the Expedition rig was right; plus with a narrow Apache canoe, I felt I didn't necessarily need the power of a big Bermudan rig. Whichever way you go, you'll find Dave at Solway Dory very approachable and helpful. And I expect that in the long term he will be getting more business from me, even though I wasn't able to afford all the big-ticket items straight off. I'm not sure if Solway Dory will be at OCSG Roadford Lake (I suspect they may be on their annual trip to the west of Scotland then) but as Ian says Dave Stubbs and Dave Poskitt are two of the most helpful guys you could ever hope to meet so I'd recommend having a chat with them at some point. I think you'd get good advice from them even if it's in regard to making some of your own components. With regard to your list I think you're on the right tracks there but I would seriously think about fitting some form of buoyancy to your canoe. The chances of an accidental capsize are increased by sailing (I know this from personal experience ) and displacing some water with buoyancy is a sensible precaution. A little lateral thinking could help to reduce the costs, OCSG member Graham D has used inflatable gym fitness balls in the ends of his canoe in place of buoyancy bags. I think he got them from Argos or somewhere like that for next to nothing. The 35 square foot rig can still be a handful for anyone without a little experience, especially on large open water, hence the need to develop a high spec version that reefs down to 20 square foot! The opening post was considering an umbrella or a small tarp and now we are talking about 35 square feet of sail capable of chucking him into the deepend very quickly! In fairness, Chris is right. If you see yourself getting into sailing later, then a 35 square foor rig could be all the sail you will ever need, but then I would also ask the question, would it really be all the sail you will ever need? Chris has been bitten by the sailing bug and is very enthusiastic at the moment, which is nice to see, but you need to weigh up what you currently need, what you have to spend and what you might need in the future. Do you see Chris upgrading his reefable Expedition rig for something bigger one day? I certainly do! It is big enough for his current skills and rudderless setup, but after he has a rudder, a pivoting leeboard and more experience, I believe that he will hardly use the reefing parts of his sail a year from now. It will be the 50 square foot Bermudan rig next with a couple of outriggers or an upgrade to the Shearwater! I won't be adding the reefing option to my 35 square foot Expedition rig because I am happy with the size and with a sailing background, I am comfortable sailing in more challenging conditions, especially now that I have a rudder, but our friend with limited knowledge and experience needs to learn the basics first. As he would be sailing in open water where the wind speeds are generally higher, I feel that he will probably have enough to contend with if he had the smaller 25 square foot rig and a clip-on leeboard. The excellent thing about the clip-on leeboard is that he would probably be steering with his paddle and the clip-on leeboard can be moved to any position along the gunwales. This allows him to balance the direction of the canoe precisely with a slight amount of weatherhelm. 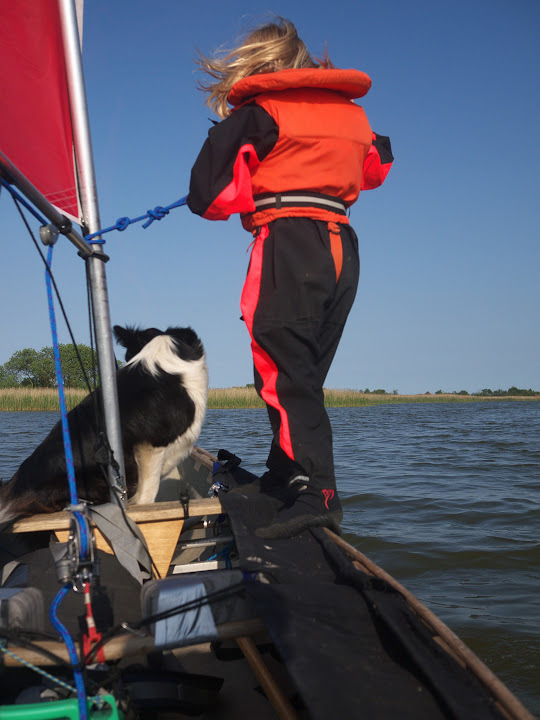 He asked for something he could use when the winds are too strong to paddle, which the 25 square foot rig is. In the lightest of winds where a 25 square foot rig underperforms, he would be as well to paddle instead. It would also be a good sail to learn all about sailing and later if he gets the bug, he can simply sell his smaller rig and upgrade to a Bermudan or something. He just drops the new rig into the original mast thwart & foot and off he goes. Conversely the smaller, cheaper rig might be all he ever needs. I will support the idea of biting the bullet though and just buying an SD rig if you are looking for up-wind sailing rather than trying to make something yourself. The chances of making anything decent for that kind of money will be virtually impossible and you will look back afterwards and regret wasting all that time on something inferior for about the same money. From your original brief, you need a small Expedition rig and a clip-on leeboard & your done. Around £200 or thereabouts. If you plan more in the way of sailing your ultimately going to be spending double this & more for rudders, leeboards, outriggers, side buoyancy bags, blocks & cleets. Lots to think about. Just try to keep a clear head and things will fall into place naturally.